Our Terms and Conditions allow the below Lesson Plan and Worksheets to be used for immediate family, home use ONLY. Use beyond this is a violation. Self-care and Manners: Say "Thank you"
- Sunburst - Place a dollop of yellow paint on a piece of paper. 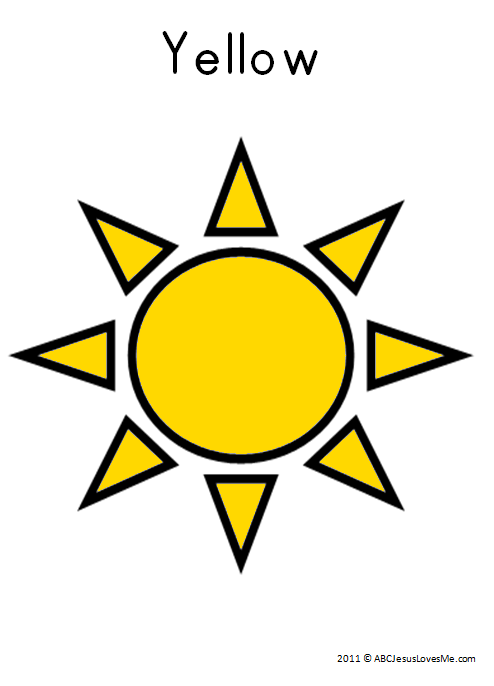 Using a cotton swab, popsicle stick or the child's finger, pull the paint away to make sun rays. - Create a Creation Mobile. Using the worksheet as a template, cut the shapes out of appropriately colored paper. 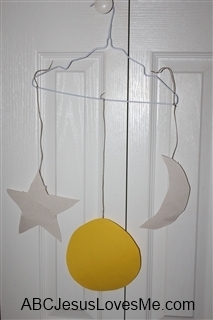 Add a string to the cut outs and hang to create a mobile. - Happy Sun - Paint a paper plate yellow. Add a face and yellow streamers along the edges. - Color one of the ABCJLM Yellow Worksheets with a jumbo yellow crayon. - Do a Color Walk: Walk around the house or neighborhood looking for the color yellow. 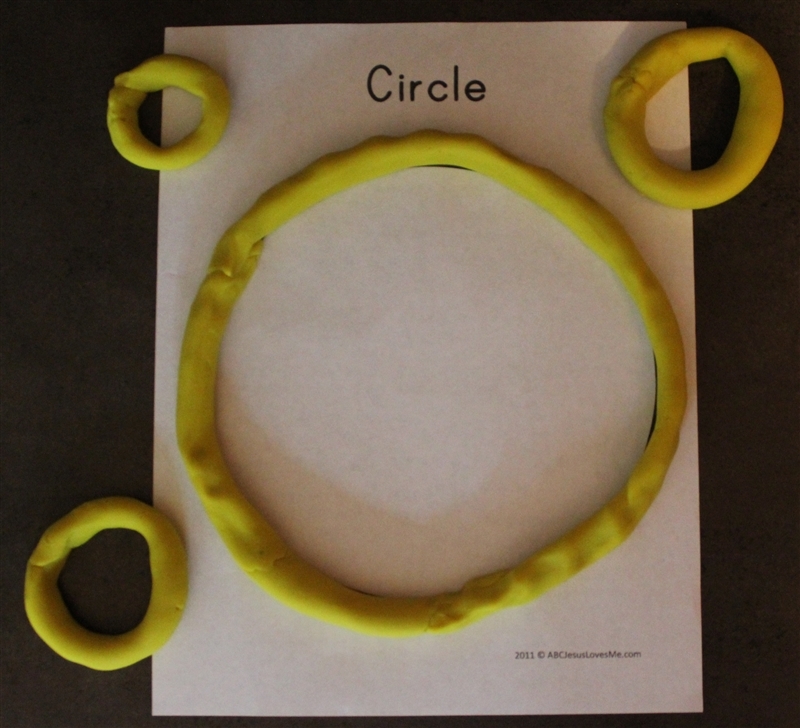 Using yellow play dough, make "snakes" to form long lines. Join the ends to make a circle. Add rays (lines) to a large circle to create a sun. Because play dough sometimes ends up in the mouth, I encourage you to make your own. Click to see my favorite play dough recipe. 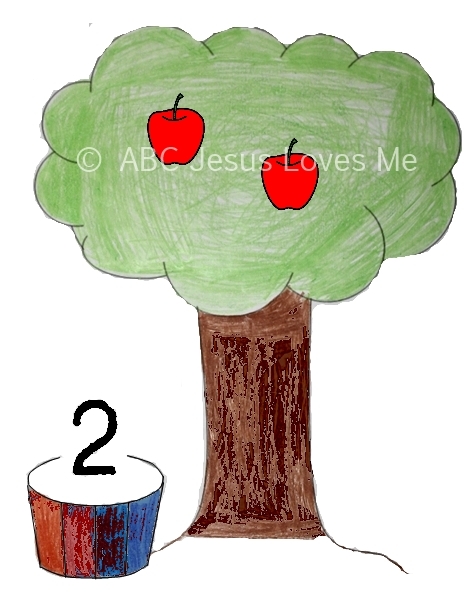 This week use jumbo colored pencils to decorate the Apple Tree #2 worksheet. Add two apple stickers. Continue to count items throughout the day. Help the child remember to say "thank you" after anyone gives or helps him/her with something. Saying "thank you" shows respect and gratitude. 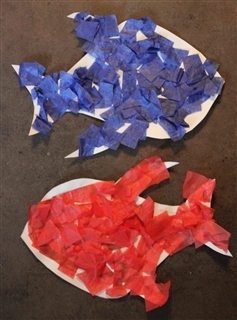 - Glue squares of tissue paper on the Red Fish Blue Fish worksheet to create one red fish and one blue fish. Use the fish to work on counting "1, 2". Be sure to point to each fish while counting. Put together Peg Puzzles. Encourage your child to pick up the puzzle pieces using his/her thumb and index finger.